The Congo River is the second largest river in the world with an average discharge of 44,000 m3/s. It forms the border between Congo and the Democratic Republic of Congo. 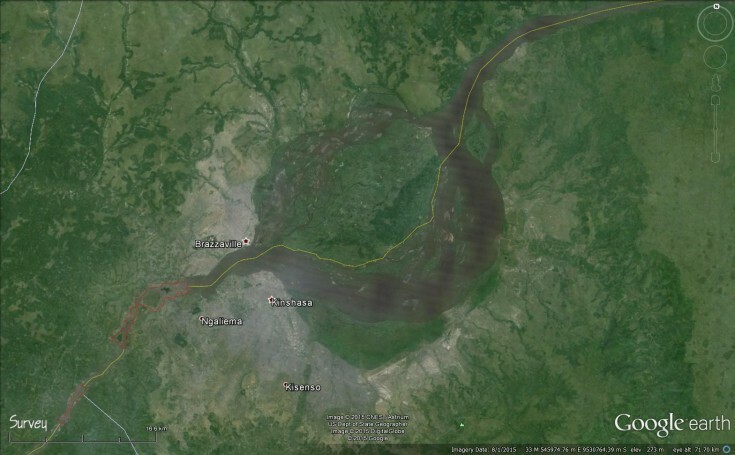 Deltares recently studied the hydraulic and morphodynamic effects of foreseen works for improving navigability on Congo River at Brazzaville, including evaluating different alternative measures. In the project area (Figure 1), the river splits into two branches. The left branch is the larger one carrying more than 75% of total discharge. So, there is no problem with navigability there. However, the discharge of the right branch is much lower and as a result the morphology there is rather complex and dynamic with braiding river features. This results in unpredictable evolution of branches that creates sedimentation problems in the navigation channel, particularly near Brazaville port. Consequently, maintenance of the fairway in the right branch has become more difficult and a sustainable way of addressing this issue is required. Deltares was involved in hydraulic and morphodynamic analysis of the right branch (at Brazaville) with a particular focus on flow division at the bifurcation point. With numerical modelling (Delft3D) and using satellite images, Deltares first predicted the short-term evolution of the morphological system. The numerical analysis was conducted to simulate discharge distribution between these two branches and corresponding morphological effects. The model showed correct trend of discharge distribution as observed in present condition. Then we used the numerical model to assess the effectiveness of possible alternative measures to improve river navigability in the left branch. These included structural (groynes, weirs and bottom vanes) and non-structural/recurrent (smart dredging and dumping) measures. These analyses indicated that structural intervention may not be necessary. The models were able to show that it is better to make use of the expected autonomous trend of increasing discharge in the left branch that is the result of morphological developments upstream of the study area. As long as the autonomous developments do not lead to any adverse effects, this natural development will provide the improved conditions for navigability autonomously. This not only saves a lot of money on construction, it is also a very sustainable way of making use of natural processes.